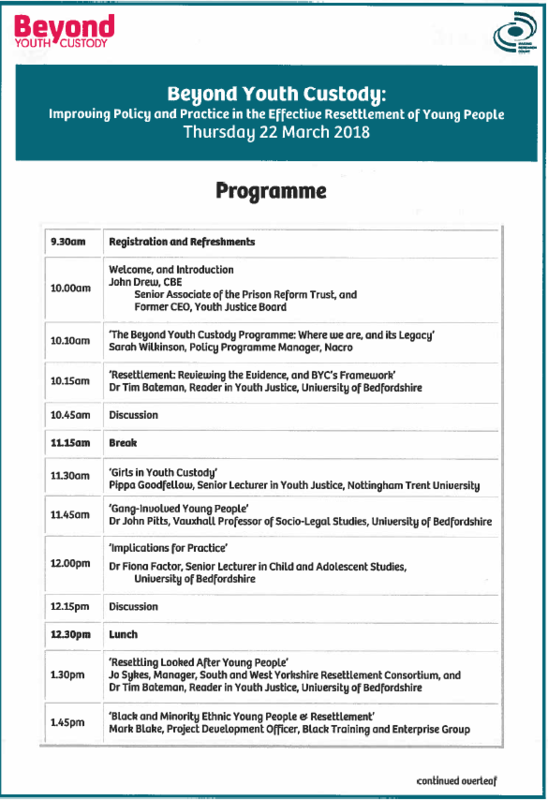 On Thursday 22 March 2018, BYC co-hosted a conference in London on the improvement of policy and practice in the effective resettlement of young people, in partnership with Making Research Count at the University of Bedfordshire and King’s College London. The day combined talks and discussions on several topics from BYC researchers and youth justice professionals about effective resettlement, in particular the resettlement of vulnerable groups including girls and young women, black and minority ethnic young people , gang involved young people and looked after young people. The conference provided an opportunity for stakeholders from a diverse range of backgrounds (including youth justice, social work, social care and from both voluntary and statutory sectors) to network, share good practice, learn from each other and from the work carried out over six-years of the BYC programme and the resources that have been developed from that work. Additionally, all of the presentations used during the day are available to download below. “It was fantastic to bring the many strands of BYC’s research together at one event and to hear from the diverse range of practitioners in the room. Key themes throughout the presentations – also reflected in the Q&A and discussions – were the importance of co-creation and listening to young people, trusting relationships, effective multi-agency, and joined-up working, including breaking down barriers between custody and community.